Many companies are looking for a 911 panic button for their facility, because of the violence we are experiencing in America today. Global and domestic terrorism is a huge problem, and companies are looking for ways to actively respond. Many companies are buying security products online and out of security magazines. Corporate management teams purchase metal detectors, buzz-in systems, surveillance cameras, and all these great safety products that become a hindrance to daily operations. Therefore, security initiatives are often then taken away. These efforts become a nuisance to day-to-day functions. Finding solutions to a security problem should be cultivated and embraced by your facility. What is the Difference Between a Traditional and Technology Driven 911 Panic Button? There is a significant problem with traditional 911 panic button. This type of 911 panic button system is a blanket product that usually requires a construction crew to install which interrupts daily office activities. For instance, many conventional 911 panic buttons are offered through local alarm companies. The alarm company hardwires the panic devices in through your phone system to be able to send out alerts. The problem with that is, you do not know how long it takes to contact responders or if it is even working. CRS tested some old-fashioned panic systems a few years ago. We are still waiting for the confirmation to go through that the alert was received. The old school 911 panic button defaulted, and no one knew. Imagine a situation where you think the signal went through to responders and it did not. What do you guess is going to happen? Software-driven 911 panic buttons offer security initiatives in a panic button for your company that is technology based. There are systems in today’s market that integrate internal and external notification alerts to multiple people, using various channels ALL at the push of a button. You also get the benefit of numerous alert levels instead of just the one alert level offered by traditional panic systems. Furthermore, modern notification systems are easier to manage. You can usually make changes from one centralized point without contacting your local alarm company for assistance. How do you know a Computer-Based 911 Panic Button is a Right Choice for Your Facility? Do Staff Members Need a Way to Call for Assistance Safely? Nurse’s stations, HR offices, and receptionist’s desks are some of the many places where workplace violence occurs. Any employee, no matter their position in the company, can become a victim of violence. 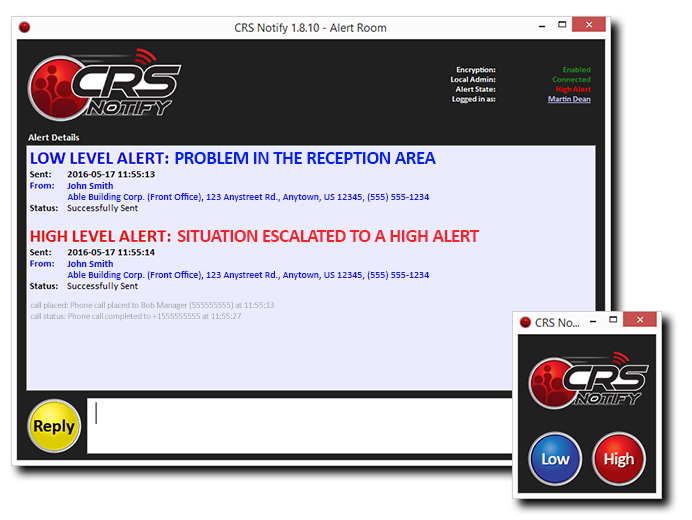 A 911 panic button from CRS Notify can offer these employees a better sense of security. 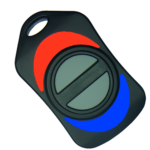 The 911 panic button can allow them to call for help quickly and discreetly without drawing attention and putting themselves in danger. Moreover, computer-based 911 panic buttons make it easier to contact the authorities when a traditional 911 phone call might not be possible. Do Staff Members Need a Way to be Notified of a Crisis? 911 panic buttons from CRS Notify send out mass notifications to employees and responders. This rapid alert cuts warning times down to seconds instead of minutes. Furthermore, this type of notification strengthens the response time of responders and allows employees to time to react efficiently to the crisis. Once authorities respond to the alert, there is a greater chance of catching the assailant. Through multiple communication channels, the crisis information is directed to staff members. Having this valuable information in a timely fashion can save lives. Do You Want a Way to Warn Authorities Quickly Yet Discreetly? 911 panic button from CRS Notify help to protect employees from life-threatening incidents. Moreover, the rapid notification gives authorities needed information to respond to the crisis. With the click of your computer mouse or push of a button on a hardware device allows staff to send an alert without alerting the criminal. In conclusion, a dedicated 911 panic button on your network adds a valuable layer of security. A holdup switch system quickly and silently asks for aid and offer employees a better sense of security. 911 panic buttons are a solution you can count on in a crisis. Still Unsure About a 911 Panic Button? Contact us for more information to make the best decision for your 911 panic button.